In the spirit of honoring all Veterans, this month we want to feature two of our representatives who served in the U.S. Armed Forces! Thank you Richard Wisdom and Fred Bennett so very much for your service! Richard served as a Deck Hand, checking the injection seat before flight. The Constellation was the ship on which he served where he traveled to Australia. (6 months out, 6 months in.) He proudly comes from a military family with his Dad having served in the Army and his Uncle who served in the Air Force! Richard is married (1990) . He and his wife have two children and two grandchildren. He is the owner of his own garage door business. Thank you for your service, Richard! Well done! Following in the proud military tradition of his father, who was a “Navy man,” Fred enlisted in the air force at the age of 19 directly after his high school graduation in Detroit Michigan. He enlisted with 3 high school buddies hoping to stay together. However the air force had other plans and the foursome was separated, all landing in different military bases across the country. Fred was assigned to Blytheville AFB just outside Blytheville, AR where he proudly served as a member of the military police for the next 3.5 years. The base, located between St. Louis and Memphis, was originally opened in 1942 as an army airfield and advanced flying school. With the end of the Korean War, the base maintained a small flight program, but was used primarily to process military members being discharged. At any given time, there were close to 33,000 men and women on the base – With our Fred as a member of one of the “Peace keeping, security team.” Fred not only provided security for the enlisted personnel, but also for the overall security of base operations. Your memory often changes as you grow older. But memory loss that disrupts daily life is not a typical part of aging. It may be a symptom of dementia. Dementia is a slow decline in memory, thinking and reasoning skills. The most common form of dementia is Alzheimer’s (AHLZ-high-merz) disease, a fatal disorder that results in the loss of brain cells and function. It may be hard to know the difference between age-related changes and the first signs of Alzheimer’s disease. Some people may recognize changes in themselves before anyone else notices.Other times, friends and family will be the first to observe changes in memory, behavior or abilities.To help identify problems early, the Alzheimer’s Association® has created a list of warning signs for Alzheimer’s and other dementias. Individuals may experience one or more of these in different degrees. If you or someone you care about is experiencing any of the 10 warning signs of Alzheimer’s disease, please see a doctor to find the cause. Early diagnosis gives you a chance to seek treatment and plan for your future. The Alzheimer’s Association can help. 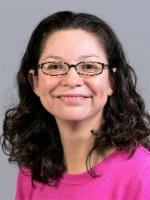 Care4You is honored to feature Linda Loera as our Professional Spotlight. Thank you Linda for everything that you do in our community to help all of us have a better understanding about Alzheimer’s! We really appreciate you! 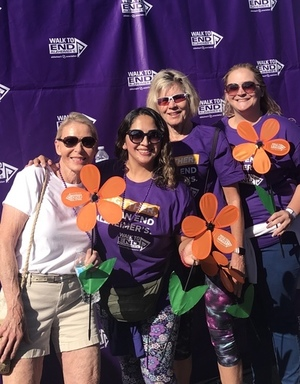 Linda Loera is a Community Outreach Specialist with the Alzheimer’s Association, CA – Southland Chapter. 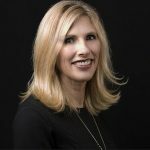 Her responsibilities include educating the community about Alzheimer’s disease, participating in community events to bring awareness to the disease, and supporting families and caregivers through care consultations, support groups and providing information and resources. Before joining the Alzheimer’s Association, Linda worked for the HICAP program for 11 years, counseling and advocating on behalf of Medicare beneficiaries and creating relationships with community organizations. She is bilingual in Spanish and English, earned a B.A. and M.A. in Latin American Studies as well as an M.A. in Urban Planning from the University of California, Los Angeles. 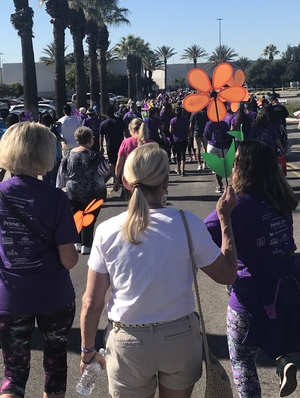 On September 16, 2018 Care 4 You participated in the Walk to End Alzheimer’s through the Alzheimer’s Association at the Ontario Mills. We walked over 2.5 miles around the mall along with approximately 1,500 participants. 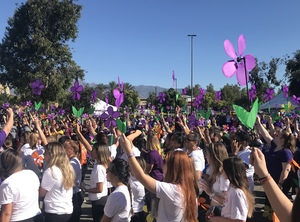 This year’s event raised more than $150,000 for Alzheimer’s research to find a cure. 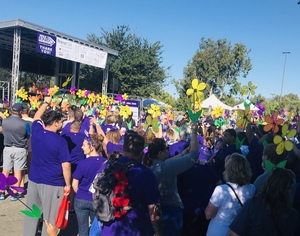 Each of the flowers represents caregivers for someone with Alzheimer’s, those who have lost someone to Alzheimer’s, those currently with Alzheimer’s, and supporters of a cure for Alzheimer’s. “Readmission is a term used when a patient is admitted back to the hospital for in-patient care soon after being discharged. OPA’s Quality Report Cards use a quality measure of hospital readmissions that occur within 30 days of being discharged for the same or a related medical condition. Unfortunately, hospital readmissions occur far too often and can lead to more serious health problems. The good news is that many readmissions can be prevented with proper treatment planning and follow-up. Patients can do their part to prevent readmission by following their care plan, tracking their medicines, and keeping follow-up appointments. Why is it important to prevent a readmission? Both your health and finances are put further at risk if you face a hospital readmission. Each time you are admitted to the hospital, you probably will have to pay a deductible or another co-payment. In addition to the cost of the hospital care, the delay in recovery from your illness can postpone your return to work. What can be done to prevent a readmission? Ask questions: Make sure you understand the information given to you by your doctor, nurse or pharmacist. Repeat their instructions to make sure you understand them. It is also helpful to have a family member or friend with you to take notes. A list of your medical problems.Know your diagnosis, potential complications, and who to call if you need assistance. A schedule of follow-up appointments. See your primary care doctor or specialist as directed. A list of your medications with clear written instructions about when to take them and for how long, as well as any possible side effects. A list of equipment you might need, such as wheelchair or hospital bed. A list of recommended home modifications, such as grab bars in the bathroom. Try to make these changes to your home before you leave the hospital. A list of any activities to avoid and for how long. If your hospital does not give you a discharge plan, you can use this discharge checklist to help you ask questions of the hospital staff. Create a support team to help you at home: Have a family member, friend and/or other caregiver help you at home with meals, medications, personal hygiene and other necessary care. Know what to do if you don’t feel well: Know the danger signs for your condition and what you will do if your symptoms get worse. Know who to call during the day, at night and on weekends. Care4You is honored to feature Mary Winners BSBA, Certified Gerontologist as our Professional Spotlight! Thank you Mary, for all that you do in your exceptional service to those in need. Well done! Mary has over a decade of experience in the business development aspect of healthcare. While physicians and nurses provide medical recommendations, Mary understands the other side of health care-the confusing maze of health care options and unknowns. She has extensive knowledge in acute care hospitalization, Gero-psychiatric issues, Alzheimer’s and dementia care, hospice, assisted living and other senior care options. 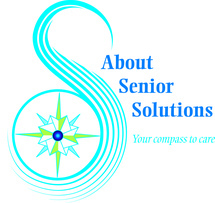 A noted speaker and adviser, Mary has provided expert services to a wide variety of seniors in every economic category. Her ability to accurately pinpoint and guide families as they deal with emotional life changing events gives Mary an insight that has no parallel.